Size of Female: 30-35 lbs., 17-18 in. 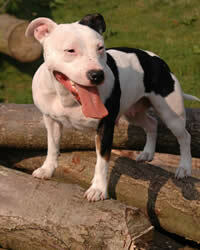 The Staffordshire Bull Terrier is small, friendly family dog that is courageous enough to function as a protector. The breed is a fierce fighter, a faithful lover and a good nanny rolled into one. It resembles a Pit Bull in appearance. When rodent killing became common fare in the mid-19th century, an interest in dog fighting led to the emergence of the Staffordshire Bull Terrier in England. The early Staffies were bred from local terriers and bulldogs, producing a fierce dog with a nimble size and powerful jaws. The very purpose for which they were created has given this dog breed a tainted reputation. History records that the dogs had to be beaten harshly in order to make them even more aggressive against their rivals inside the fighting pit. Today, the Staffies pride themselves not only as guardians but also as endearing family pets and amazing show dogs. To raise an even-tempered Staffie, extensive and early socialization is a must. You will commonly observe lines of aggression when they are around other animals. However, the dogs are rather clingy, sociable and protective of their owners. They have strong nursing instincts around kids and have earned the title “nanny dog” in English homes. Living Environment – Despite their impressive fighting abilities, this breed is still meant to be a house dog. The breed is sensitive to both hot and chilly climates and is suited to an environment where temperature extremes are not the norm. It also craves for human companionship and may suffer from separation anxiety if you ignore the dog’s social needs. An enclosed yard and an assortment of chewable toys are common in homes that raise Staffies. Grooming – The dogs are low-maintenance when it comes to coat care, but since they are average shedders, regular vacuuming and house cleanups become a lifelong commitment. Regular baths are also necessary. Believe it or not, this dog breed is a walking flea and tick magnet. Diet & Exercise – Experts recommend a combination of wet and dry foods. Since the Staffie has a voracious appetite and an indiscriminating taste, proper food rationing and weight monitoring are crucial. You can help your pooch counter rapid weight gain through daily vigorous exercise. Any unmet exercise needs will often translate to obesity, destructive chewing and broken furniture. Remember to keep your Staffie leashed when venturing into public places. Health – Save for its sensitivity to extreme temperatures and some cases of cataracts, Staffies have a good reputation in the health department. Experts believe the breed may have an extremely high pain threshold that masks potential health concerns. Staffies are moderately trainable. There are at least 3 requisites to success in this field: extensive socialization, mandatory obedience training and dominant pack leadership. With the right approach, you can groom the Staffordshire Bull Terrier to emerge as a good therapy dog and an able competitor in game sports and agility contests.